I was at Wholefood’s recently and while browsing the bulk bin aisle, I wanted to purchase an ingredient that I have never tried before. I saw the red quinoa and started scooping it into a bag. I’ve had quinoa before but never had the red kind. I heard it is supposed to be nuttier than the regular kind. I was excited to try it out and once I got home, I looked for recipes that I wanted to try. 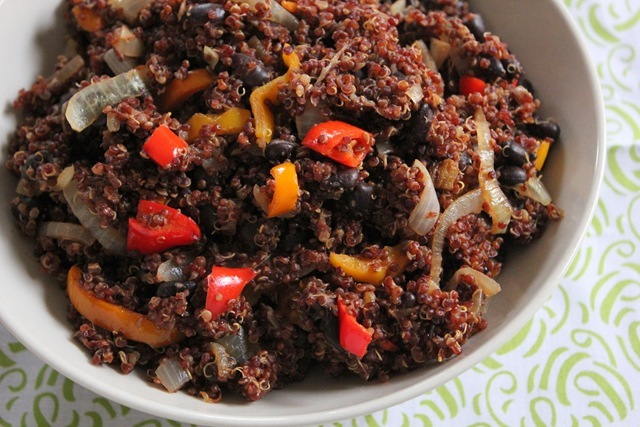 I chose to make the Black Bean Cocoa Quinoa recipe I found from Emily’s blog Daily Garnish because I’ve never tried cooking a dish before using cocoa. I also love dishes that have a lot of texture so after reading all the ingredients she used, I knew there would be a lot of different texture. I used the ingredients I had available and adapted the dish from the original recipe. The secret ingredient that makes this recipe so good is the COCOA powder. Start by rinsing the quinoa – this removes some of the bitterness and soapy residue that is sometimes on the outer shells. The best way to get good flavor into your grains is to cook them WITH spices, rather than adding spices in at the end. The heat of the cooking process intensifies the spice flavor! I used chili powder, ground cinnamon, cayenne pepper, and coriander. 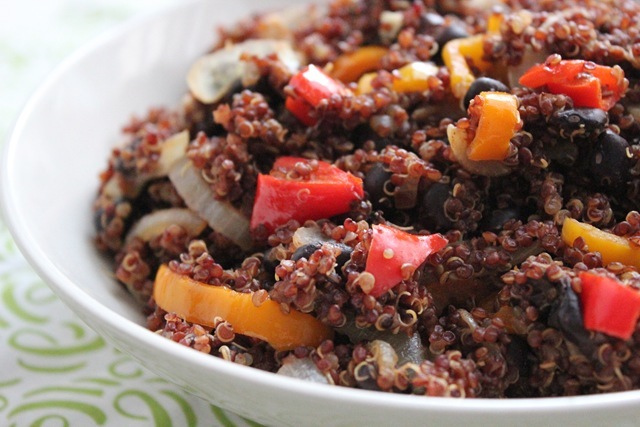 Cook your quinoa on stove top – Combine quinoa with 2 cups water, spices, and cocoa powder, and bring up to a simmer. Once simmering, cover and cook for about 15-20 minutes, or until all liquid is absorbed. Be careful to make sure it doesn’t stick to the bottom of the pan! 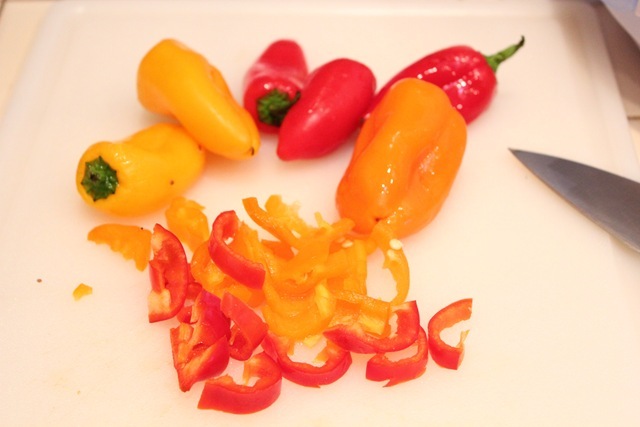 While the quinoa cooks, you can begin to cut the onions and bell peppers. 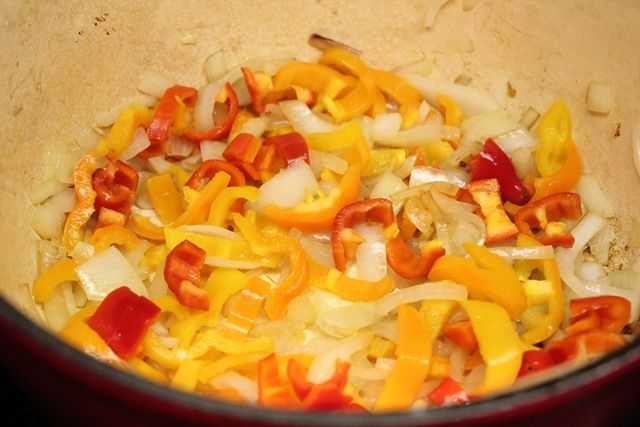 On medium high heat, add a little bit of olive oil to your pan, and then cook the diced onion until soft. After ten minutes or so, add the pepper and continue to sauté for another 5 minutes. At this point the quinoa should be ready. 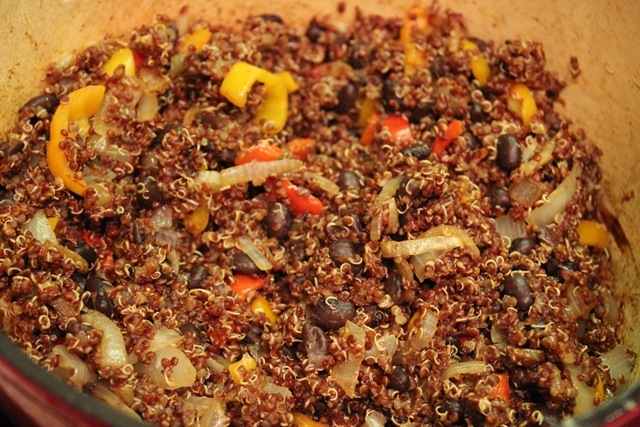 Go ahead and fluff your quinoa and add it to the pan with your veggies, along with a rinsed can of black beans. Season to taste with salt and pepper, and stir over medium heat for just a few minutes, to ensure that the mixture is heated throughout. This dish was really delicious. The flavor is complex, but they all compliment each other. Cooking for the first time with cocoa, I didn’t really know what to expect. I know it’s not chocolate but for some reason I thought it would have a hint of sweetness, but not at all. I think it added richness to the dish. The bell peppers, onions and black beans were great together. I also like the kick that the cayenne pepper and chili powder added. I cooked this dish for me and my mom, so I held back a little on the spiciness. I didn’t have any avocado and tomatoes, but I would imagine they would be great add-ins. 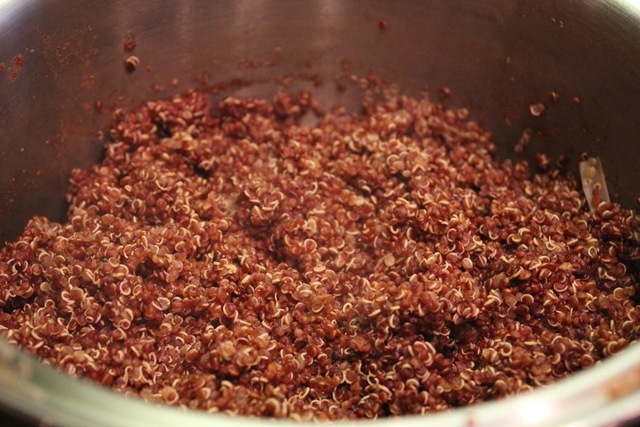 I also loved the red quinoa and how nuttier and chewier it is than the regular quinoa. I’m glad I tried it. I enjoyed the dish with baked fish and green beans sautéed in butter. Have you ever cooked a dish using cocoa before? 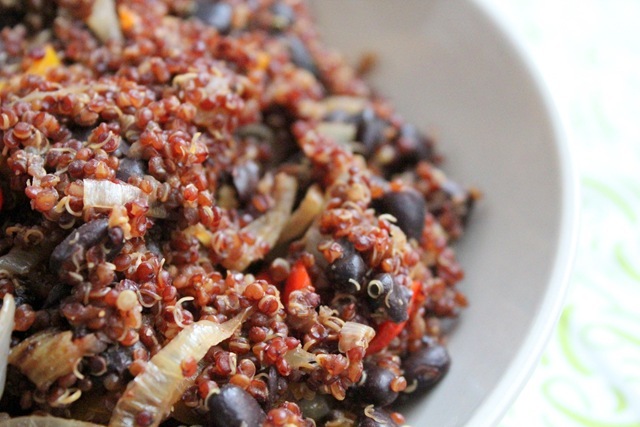 Have you tried red quinoa? Red quiona is actually the only kind i’ve tried and I really enjoyed it! That looks pretty dang tasty too! What an interesting combo of flavors! 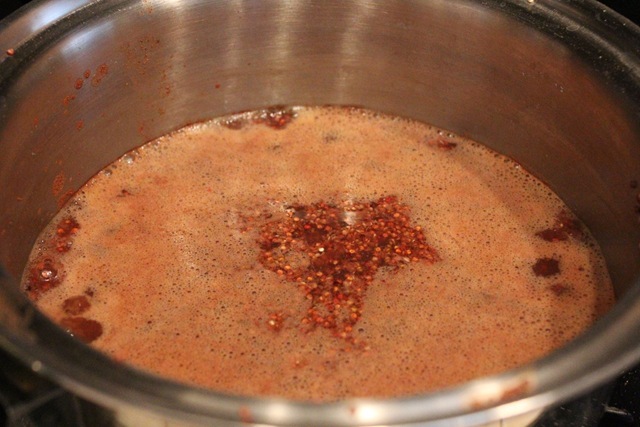 Ive used cocoa powder in chili before and i love it !! I have not had quinoa in forever, I do like it a lot though! Never tried the red kind! The recipe you made looks really good! 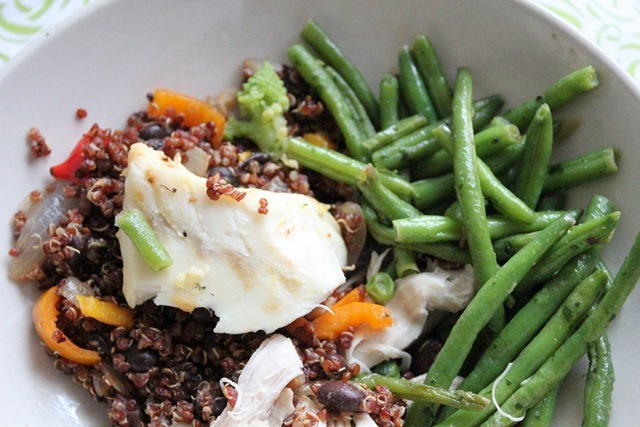 I love quinoa so much, besides the amazing nutritional stats, it really fills me up and keeps me full! Thanks for stopping by my blog and saying hi! I know its countdown to wedding busy time! Same here!! I actually haven’t but I’ve been wanting to make a Mexican dish called Mole’ from scratch. Some recipes use the Ibarra Chocolate but I was thinking of making my own with the cocoa, cinnamon and other spices. It’s a lot of ingredients I would say like about 20 or so some call for less but I think the more the more authentic it will be. 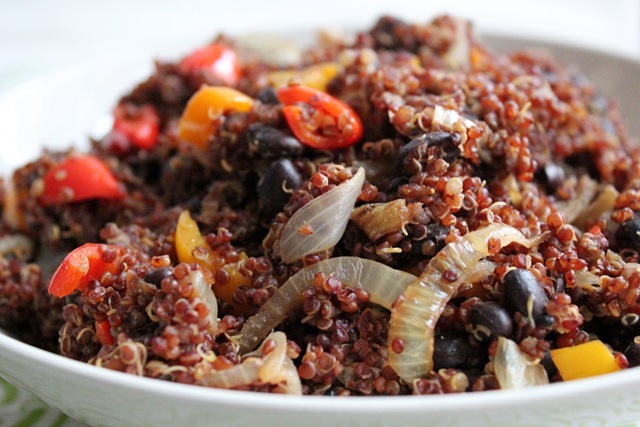 I haven’t tried the Red Quinoa either I guess I have to try that I love the nuttiness in my grains so seems like a winner to me. Whoa, creative!! I don’t think I’ve ever used cocoa in a savory recipe before but it sounds really good. 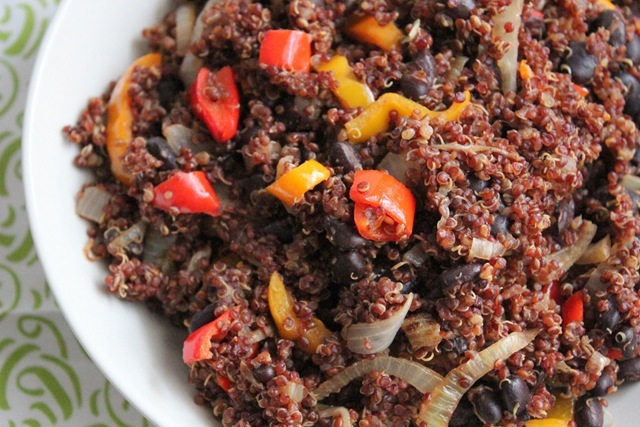 I love, love black beans & quinoa, too so this sounds perfect. I’ve eaten several dishes with cocoa in it but have never cooked wtih it. I just never thought of it, so thanks for inspiring me. This looks amazing! Thank you for my supper inspiration!